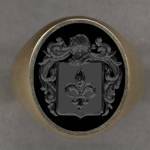 If you do not have a family crest and you want to see what it looks like before you order our jewelry, you may send for a JPEG image of the ring of your choice as it would appear with the coat of arms (family crest) for your name engraved on it. If you do have a family crest already and would like to see how it looks hand engraved on the ring of your choice just send us a copy of it, or let us know where we can find it, and we’ll be glad to send you a JPEG image of your crest as it would appear on your ring. There is no charge for this service. It is a courtesy of Heraldica Imports, the foremost hand engraver of family crest jewelry for over forty years! Please note that this is not a history of your family name, it is just a picture of what a crest for your family name would look as a hand engraved family crest ring. No genealogical representation is intended or implied. You may, of course, order your jewelry directly without going through this process. 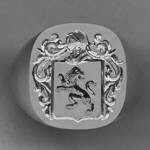 Use this form to order your JPEG image of a family crest ring for your name. 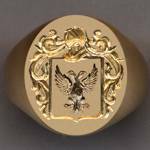 If you asked us to look up your name and we do find a record of a coat of arms for your family name, or if you sent us the sample image of your family coat of arms, then we will e-mail you the proof of the ring you chose as it would look engraved with your family coat of arms. You may use the proof or image for any non-commercial purpose you wish. If you have any questions please e-mail us or call us at 1-800-782-0933 or +1 212-719-4204. Note that all fields marked * are required. If you do not supply the information, it will delay your request. Also, note that if you use a spam or junk e-mail filter, please set it to allow messages from heraldica.com to reach you. If you DO NOT know what your family coat of arms looks like, please enter the family name you are interested in here and we will send you the results. If you DO know what your family coat of arms looks like, please send us the drawing or description of your coat of arms, or tell us where to find it using the comments section below. You can e-mail, fax or call in the information using Heraldica's contact details at the bottom of the page. If you have any questions, just call us! If sending a separate communication, please include your name and phone number so that we can match your submission to this form! Please select the style of ring you would like to see your coat of arms on. Of course, when you order your ring, you can choose from any of our dozens of models. Classic oval shaped gold crest ring such as our #18 in 14k gold shown for Rucker. Classic cushion shaped silver crest ring such as our #23 in sterling silver shown for Jenkins. Classic oval shaped stone crest ring such as our #1A shown in 14k yellow gold and black onyx for Horn.